Sometimes you have to move a compressor from place to place. They can be unwieldy if left upright. Can I lay my compressor down to move it is a question many people have about moving an air compressor from location to location. As is often the case, there is no single answer. Various issues make any answer a bit complex, so – can I lay my compressor down – has to responded to in a number of ways. Here are the things to consider when you go about moving your air compressor and whether or not to lay the sucker down so it doesn’t fall over in the bed of the pickup truck and smash something! Is It A New Air Compressor? If it is a new air compressor being transported home from the store for the first time, it typically can be laid down with no problem. That same compressor, after being in use for some, may create maintenance problems if the compressor is laid down. Here’s why. If it is transporting a new air compressor that is what is being attempted, often, you can lay them down. The reason is that new air compressors rarely have lubricating oil in them in the store. Instructions will often state that you make sure you add the oil before you start it up. The new air compressor has been run little or not at all. No condensate will have built up in the tank, to slosh around and deposit ‘tank gunk’ in places it is not supposed to be, so if a new compressor is laid down, there should be no issues, providing it’s secure in the mode of transport not to slide and bounce around and break off a part or two. After it’s been is use for some time, any air compressor will start to build up gunk in the bottom of the compressor tank. This gunk is made up of dirt particles that have bypassed or slipped through the intake filter and have been driven into the tank along with the compressed air and the water that compressing air always generates. Even if the tank is drained religiously (and really, do you actually drain the tank after every use like it is supposed to?) some moisture remains in the compressor tank. This moisture mixes with the ingested dirt, creating a sludge. If the compressor is laid down, the drain and accompanying sludge will migrate around inside the tank. If that sludge gets to your tank check valve – which is commonly located where the air line from the pump enters the compressor tank – it will foul it. Symptoms of this happening can be a continuous air leak from the compressor unloader valve, or a buildup of back pressure increasing the load on the motor as the tank check valve itself becomes mired in this crud. If the compressor is left for some time, that crud will dry on the flapper or ball in the tank check valve, preventing it from moving and doing it’s job. The increase in back pressure may overload the motor, and the motor may hum, overheat, turn off on thermal overload… or the compressor may not start at all. That same sludge can roll over the compressor tank drain too, possibly plugging it so that no air or water can escape the next time the tank is drained. Is The Compressor Oil Lubed? 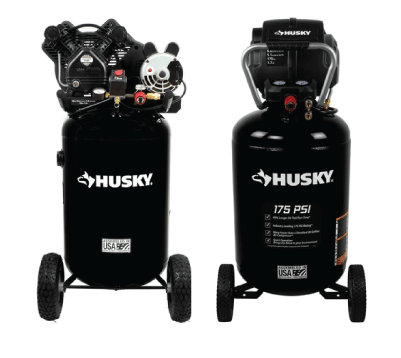 Portable air compressors can be purchased in an oil-lubricated or oil-free configuration. In the oil lubed model of air compressor usually (but NOT always so check!) the compressor needs to have oil added to a sump when it has arrived at its destination. When the compressor is running that oil oil in the sump splashes up onto the crank and piston from underneath, lubricating the parts with oil as the compressor is running. As an aside why is oil used in most compressors specified to be detergent free? Reason being, since there is no oil filter on splash lubed air compressor, any debris in the oil must be allowed to sink to the bottom of the sump when the compressor stop. That crud is far enough down in the sump that it should not splash up onto the compressor parts while the compressor is running, and yet, can be drained away when the oil is changed. Just like you normally would not turn the car engine upside down and allow dirty oil to flow into areas it was not supposed to go in the motor, laying an oil lubricated compressor down with oil in the sump could allow the lubricating oil, and any crud that had settled, to flow into areas in the compressor it is not supposed to go, contaminating those areas with grit etc. If the compressor is oil lubed, and it is acquired new with no oil in the sump, you should be good with laying it down to transport it as long as it is well secured. If the compressor is an oil-free model, the compressor has “lube for life” from the factory, and it is not required to add oil and no splash lubrication of the compressor pump occurs while the compressor is running. As long as there is NO water in the tank, and the compressor is well secured, then you can lay that compressor down. Can I lay my compressor down to move it? Sure you can, just as long as you understand the ramifications and maintenance issues that my occur as a result. For me, no way will I lay one down, regardless of being new, oil lubed, lube free whatever. I don’t want the risk. I’ll tie it securely upright, for sure, even if I have to borrow a bigger truck. You have a small air compressor? No way you should need to lay it down. Tie it upright and don’t worry. Can I Lay My Compressor Down? Add your comment here, and please upload some photos focusing on the problem area?